The Tiananmen Square protests of 1989 culminating in the Tiananmen Square Massacre (referred to in Chinese as the June Fourth Incident, to avoid confusion with two other Tiananmen Square protests) were a series of demonstrations in and near Tiananmen Square in the People's Republic of China (PRC) between April 15 and June 4, 1989. They were mainly led by Beijing students and intellectuals. The protests occurred in a year that saw the collapse of a number of communist governments around the world. The protests were sparked by the death of pro-market and pro-democracy official, Hu Yaobang, whom protesters wanted to mourn. By the eve of Hu's funeral, it had reached 100,000 people on the Tiananmen Square. While the protests lacked a unified cause or leadership, participants were generally against the government's authoritarianism and voiced calls for economic change and democratic reform within the structure of the government. The demonstrations centered on Tiananmen Square in Beijing, but large-scale protests also occurred in cities throughout China, including Shanghai, which stayed peaceful throughout the protests. The movement lasted seven weeks from Hu's death on April 15 until tanks cleared Tiananmen Square on June 4. In Beijing, the resulting military response to the protesters by the PRC government left many civilians dead or injured. The reported tolls ranged from 200–300 (PRC government figures) and to 2000–3000 (Chinese student associations and Chinese Red Cross). In the Chinese language, the incident is most commonly known as the June Fourth Movement (Simplified Chinese: 六四运动; Traditional Chinese: 六四運動), the June Fourth Incident (Chinese: 六四事件), or colloquially, simply Six-four (June 4) (Chinese: 六四). The nomenclature of the former is consistent with the customary names of the other two great protest actions that occurred in Tiananmen Square: the May Fourth Movement of 1919, and the April Fifth Movement of 1976. Other names which have been used in the Chinese language include June Fourth Massacre (Chinese: 六四屠城; pinyin: Liù-Sì Túchéng or Chinese: 六四屠杀; pinyin: Liù-Sì Túshā). The government of the People's Republic of China has referred to the event as the Political Turmoil between Spring and Summer of 1989 (Chinese: 春夏之交的政治風波). Tiananmen Square as seen from the Tiananmen gate in 2004. Since 1978, Deng Xiaoping had led a series of economic and political reforms which had led to the gradual implementation of a market economy and some political liberalization that relaxed the system inherited from Mao Zedong. Some students and intellectuals believed that the reforms had not gone far enough and that China needed to reform its political system. They were also concerned about the social and iron-fist controls that the Communist Party of China still had. This group had also seen the political liberalization that had been undertaken in the name of glasnost by Mikhail Gorbachev, and wanted for China a comparable reform. Many workers who took part in the protests also wanted democratic reform, but opposed the new economic policies. The Tiananmen Square protests in 1989 were in large measure sparked by the death of former Secretary General Hu Yaobang: Hu Yaobang's resignation from the position of Secretary General of the CPC had been announced on January 16, 1987. His forthright calls for "rapid reform" and his almost open contempt of "Maoist excesses" had made him a suitable scapegoat in the eyes of Deng Xiaoping and others, after the pro-democracy student protests of 1986–1987. Included in his resignation was also a "humiliating self-criticism," which he was forced to issue by the Central Committee of the Communist Party. Hu Yaobang's sudden death, due to heart attack, on April 15, 1989, provided a perfect opportunity for the students to gather once again, not only to mourn the deceased Secretary General, but also to have their voices heard in "demanding a reversal of the verdict against him" and bringing renewed attention to the important issues of the 1986–1987 pro-democracy protests and possibly also to those of the Democracy Wall protests in 1978–1979. Small voluntary civilian gatherings started on April 15 around Monument to the People's Heroes in the middle of the Tiananmen Square in the form of mourning for Hu Yaobang. 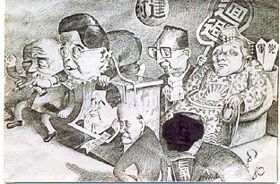 An anonymous drawing posted in a pedestrian walkway underneath Chang'an Avenue caricatures Deng Xiaoping (Simplified Chinese: 邓小平; Traditional Chinese: 鄧小平) (seated behind the lectern) as an old Chinese emperor. On the same date of April 15, many students in Peking University and Tsinghua University expressed their sorrow and mourning for Hu Yaobang by posting eulogies inside the campus and erecting shrines, some students joined the civilian mourning in Tiananmen Square in a piecemeal fashion. Organized student gatherings started outside of Beijing on a small scale in Xian and Shanghai on April 16. On the afternoon of April 17, in Beijing, 500 students from China University of Political Science and Law marched to the eastern gate of the Great Hall of the People, which is part of the Tiananmen Square, and commenced the mourning activities of Hu Yaobang. The gathering in front of the Great Hall of the People was soon deemed obstructive to the normal operation of the building, police intervened and attempted to disperse the students by persuasion, but the attempts failed. By nightfall, more students from various universities and more civilians in Beijing had joined the mourning activities. The gathering featured speakers of various background giving public speeches (mostly anonymous) commemorating Hu Yaobang, expressing their concerns of social problems. Starting midnight on April 17, 3000 students from Peking University marched from campus towards Tiananmen Square, and soon nearly a thousand students from Tsinghua University joined the rank. Upon arrival, they soon joined force with students and civilians who were in the Tiananmen Square earlier. As its size grew, the gathering of mourning gradually evolved into a "petition" nature, as students began drafting a list of pleas and suggestions (list of seven demands) they would like the government to listen to and carry out. In the morning of 18 April, students remained in the square, some gathered around the Monument to the People's Heroes singing patriotic songs, listening to impromptu speeches by the student organizers. There were another group of students staging a sit-in in front of the Great Hall of the People, the office of the Standing Committee of the National People's Congress; they demanded to see members of the Standing Committee and offered a list of seven demands. Meanwhile, a few thousand students gathered in front of Zhongnanhai building complex, the residence of the government, demanding to see government leaders and answers to their earlier demands. Students tried to muscle their way through the gate by pushing, but securities and police locking arms formed a shield that eventually deterred students' attempts to enter through the gate. Students had to reverse course to the method of sit-in. Some government officials did unofficially meet with student representatives. Unable to see official response, there was a growing frustration among students; protest was brewing. On April 20, police finally dispersed the students in front of the Zhongnanhai with force to ensure proper function of the building complex. Police employed batons and minor clashes were reported. The protests in Tiananmen Square gained momentum after news of the confrontation between students and police spread; the belief by students that the Chinese media was distorting the nature of their activities also led to increased support (although one national newspaper, the Science and Technology Daily (Simplified Chinese: 科技日报; Traditional Chinese: 科技日報), published, in its issue dated April 19, an account of April 18 sit-in). On the night of April 21, the day before Hu's funeral, some 100,000 students marched on Tiananmen Square, gathering there before the square could be closed off for the funeral. On April 22nd, they requested, in vain, to meet Premier Li Peng, widely regarded to be Hu's political rival. On the same day, protests happened in Xi'an and Changsha. From April 21 to 23, students from Beijing called for a strike at universities, which included teachers and students boycotting classes. The government, which was well aware of the political storm caused by the now-legitimized 1976 Tiananmen Incident, was alarmed. On April 26, following an internal speech made by Deng Xiaoping, the CPC's official newspaper People's Daily issued a front-page editorial titled Uphold the flag to clearly oppose any turmoil, attempting to rally the public behind the government, and accused "extremely small segments of opportunists" of plotting civil unrest. The statement enraged the students, and on April 27 about 50,000 students assembled on the streets of Beijing, disregarding the warning of a crackdown made by authorities, and demanded that the government revoke the statement. In Beijing, a majority of students from the city's numerous colleges and universities participated with support of their instructors and other intellectuals. The students rejected official Communist Party-controlled student associations and set up their own autonomous associations. The students viewed themselves as Chinese patriots, as the heirs of the May Fourth Movement for "science and democracy" of 1919. The protests also evoked memories of the Tiananmen Square protests of 1976 which had eventually led to the ousting of the Gang of Four. From its origins as a memorial to Hu Yaobang, who was seen by the students as an advocate of democracy, the students' activity gradually developed over the course of their demonstration from protests against corruption into demands for freedom of the press and an end to, or the reform of, the rule of the PRC by the Communist Party of China and Deng Xiaoping, the de facto paramount Chinese leader. Partially successful attempts were made to reach out and network with students in other cities and with workers. While the protests lacked a unified cause or leadership, participants were generally against the authoritarianism and voiced calls for economic liberalization and democratic reform within the structure of the government. Unlike the Tiananmen protests of 1987, which consisted mainly of students and intellectuals, the protests in 1989 commanded widespread support from the urban workers who were alarmed by growing inflation and corruption. In Beijing, they were supported by a large number of people. Similar numbers were found in major cities throughout mainland China such as Urumqi, Shanghai and Chongqing; and later in Hong Kong, Taiwan and Chinese communities in North America and Europe. On May 4, approximately 100,000 students and workers marched in Beijing making demands for free media reform and a formal dialogue between the authorities and student-elected representatives. A declaration demanded the government to accelerate political and economic reform.. The government rejected the proposed dialogue, only agreeing to talk to members of appointed student organizations. On May 13, two days prior to the highly-publicized state visit by the reform-minded Soviet leader Mikhail Gorbachev, huge groups of students occupied Tiananmen Square and started a hunger strike, insisting the government withdraw the accusation made in the People's Daily editorial and begin talks with the designated student representatives. Hundreds of students went on hunger strikes and were supported by hundreds of thousands of protesting students and part of the population of Beijing, for one week. Protests and strikes began at colleges in other cities, with many students traveling to Beijing to join the demonstration. Generally, the demonstration at Tiananmen Square was well-ordered, with daily marches of students from various Beijing area colleges displaying their solidarity with the boycott of college classes and with the developing demands of the protest. The students sang "The Internationale," the world socialist anthem, on their way to and within the square. The students even showed a surprising gesture of respect to the government by helping police arrest three men from Hunan Province, including Yu Dongyue, who had thrown ink on the large portrait of Mao that hangs from Tiananmen, just north of the square. The students ultimately decided that in order to sustain their movement and impede any loss of momentum a hunger strike would need to be enacted. The students' decision to undertake the hunger strike was a defining moment in their movement. The hunger strike began in May 1989 and grew to include "more than one thousand persons." The hunger strike brought widespread support for the students and "the ordinary people of Beijing rallied to protect the hunger strikers…because the act of refusing sustenance and courting government reprisals convinced onlookers that the students were not just seeking personal gains but (were) sacrificing themselves for the Chinese people as a whole." On May 19 at 4:50 A.M., General Secretary Zhao Ziyang (Simplified Chinese: 赵紫阳; Traditional Chinese: 趙紫陽) went to the Square and made a speech urging the students to end the hunger strike. Part of his speech was to become a famous quote, when he said, referring to the older generation of people in China, "We are already old, it doesn't matter to us any more." In contrast, the students were young and he urged them to stay healthy and not to sacrifice themselves so easily. Zhao's visit to the Square was his last public appearance. Partially successful attempts were made to negotiate with the PRC government, who were located nearby in Zhongnanhai, the Communist Party headquarters and leadership compound. Because of the visit of Mikhail Gorbachev, foreign media were present in mainland China in large numbers. Their coverage of the protests was extensive and generally favorable towards the protesters, but pessimistic that they would attain their goals. Toward the end of the demonstration, on May 30, a statue of the Goddess of Democracy was erected in the Square and came to symbolize the protest to television viewers worldwide. The Standing Committee of the Politburo, along with the party elders (retired but still-influential former officials of the government and Party), were, at first, hopeful that the demonstrations would be short-lived or that cosmetic reforms and investigations would satisfy the protesters. They wished to avoid violence if possible, and relied at first on their far-reaching Party apparatus in attempts to persuade the students to abandon the protest and return to their studies. One barrier to effective action was that the leadership itself supported many of the demands of the students, especially the concern with corruption. However, one large problem was that the protests contained many people with varying agendas, and hence it was unclear with whom the government could negotiate, and what the demands of the protesters were. The confusion and indecision among the protesters was also mirrored by confusion and indecision within the government. The official media mirrored this indecision as headlines in the People's Daily alternated between sympathy with the demonstrators and denouncing them. Among the top leadership, General Secretary Zhao Ziyang was strongly in favor of a soft approach to the demonstrations while Li Peng was seen to argue in favor of a crackdown. Ultimately, the decision to forcefully intervene on the demonstrations was made by a group of Party elders who saw abandonment of single-party rule as a return of the chaos of the Cultural Revolution. Although most of these people had no official position, they were able to control the military. Deng Xiaoping was chairman of the Central Military Commission and was able to declare martial law; Yang Shangkun (Simplified Chinese: 杨尚昆) was President of the People's Republic of China, which, although a symbolic position under the 1982 Constitution, was legally the commander-in-chief of the armed forces. The Party elders believed that lengthy demonstrations were a threat to the stability of the country. The demonstrators were seen as tools of advocates of "bourgeois liberalism" who were pulling the strings behind the scenes, as well as tools of elements within the party who wished to further their personal ambitions. At the beginning of the movement, the Chinese news media had a rare opportunity to broadcast the news freely and truly. Most of the news media were free to write and report whatever they wanted due to lack of control from the central and local governments. The news spread quickly across the land. According to Chinese news media's report, students and workers in over 400 cities, including cities in Inner Mongolia, also organized and started to protest. People also traveled to the capital to join the protest in the Square. University students in Shanghai also took to the streets to commemorate the death of Hu Yaobang and protest against certain policies of the government. In many cases, these were supported by the universities' Party committees. Jiang Zemin (Simplified Chinese: 江泽民; Traditional Chinese: 江澤民), then-Municipal Party Secretary, addressed the student protesters in a bandage and expressed his understanding, as he was a former student agitator before 1949. At the same time, he moved swiftly to send in police forces to control the streets and to purge Communist Party leaders who had supported the students. On April 19, the editors of the World Economic Herald, a magazine close to reformists, decided to publish, in their April 24, #439 issue, a commemorative section on Hu. Inside was an article by Yan Jiaqi, which commented favorably on the Beijing student protests on April 18 and called for a reassessment of Hu's purge in 1987. On April 21, a party official of Shanghai asked the editor in chief, Qin Benli, to change some passages. Qin Benli refused, so Chen turned to Jiang Zemin, who demanded that the article be censored. By that time, a first batch of copies of the paper had already been delivered. The remaining copies were published with a blank page. On April 26, the People's Daily published its editorial condemning the student protest. Jiang followed this cue and suspended Qin Benli. His quick rise to power following the 1989 protests has been attributed to his decisive handling of these two events. In Hong Kong, on May 27, 1989, over 300,000 people gathered at Happy Valley Racecourse for a gathering called "Democratic songs dedicated for China." Many famous Hong Kong and Taiwanese celebrities sang songs and expressed their support for the students in Beijing. The following day, a procession of 1.5 million people, one fourth of Hong Kong's population, led by Martin Lee, Szeto Wah and other organization leaders, paraded through Hong Kong Island. Across the world, especially where Chinese lived, people gathered and protested. Many governments, such as those of the USA, Japan, etc., also issued warnings advising their own citizens not to go to the PRC. Although the government declared martial law on the 20th of May, the military's entry into Beijing was blocked by throngs of protesters, and the army was eventually ordered to withdraw. Meanwhile, the demonstrations continued. The hunger strike was approaching the end of the third week, and the government resolved to end the matter before deaths occurred. After deliberation among Communist party leaders, the use of military force to resolve the crisis was ordered, and a deep divide in the Politburo resulted. General Secretary Zhao Ziyang was ousted from political leadership as a result of his support for the demonstrators. The military also lacked unity on the issue, and purportedly did not indicate immediate support for a crackdown, leaving the central leadership scrambling to search for individual divisions willing to comply with their orders. Soldiers and tanks from the 27th and 28th Armies of the People's Liberation Army were sent to take control of the city. The 27th Army was led by a commander related to Yang Shangkun. In a press conference, US President George H. W. Bush announced sanctions on the People's Republic of China, following calls to action from members of Congress such as US Senator Jesse Helms. The President suggested intelligence he had received indicated some disunity in China's military ranks, and even the possibility of clashes within the military during those days. Intelligence reports also indicated that 27th and 28th units were brought in from outside provinces because the local PLA were considered to be sympathetic to the protest and to the people of the city. Reporters described elements of the 27th as having been most responsible for civilian deaths. After their attack on the square, the 27th reportedly established defensive positions in Beijing–not of the sort designed to counter a civilian uprising, but as if to defend against attacks by other military units. Entry of the troops into the city was actively opposed by many citizens of Beijing. Protesters burned public buses and used them as roadblocks to stop the military's progress. The battle continued on the streets surrounding the Square, with protesters repeatedly advancing toward the People's Liberation Army (PLA) and constructing barricades with vehicles, while the PLA attempted to clear the streets using tear gas, rifles, and tanks. Many injured citizens were saved by rickshaw drivers who ventured into the no-man's-land between the soldiers and crowds and carried the wounded off to hospitals. After the attack on the square, live television coverage showed many people wearing black armbands in protest of the government's action, crowding various boulevards or congregating by burnt out and smoking barricades. Meanwhile, the PLA systematically established checkpoints around the city, chasing after protesters and blocking off the university district. Within the Square itself, there was a debate between those who wished to withdraw peacefully, including Han Dongfang, and those who wished to stand within the square, such as Chai Ling. The assault on the square began at 10:30 P.M. on June 3, as armored personnel carriers (APCs) and armed troops with fixed bayonets approached from various positions. These APCs rolled on up the roads, firing ahead and off to the sides, perhaps killing or wounding their own soldiers in the process. BBC reporter Kate Adie spoke of "indiscriminate fire" within the square. Eyewitness reporter Charlie Cole also saw Chinese soldiers firing AK-47s into the crowd, killing and wounding many that night. Students who sought refuge in buses were pulled out by groups of soldiers and beaten with heavy sticks. Even students attempting to leave the square were beset by soldiers and beaten. Leaders of the protest inside the square, where some had attempted to erect flimsy barricades ahead of the APCs, were said to have "implored" the students not to use weapons (such as molotov cocktails) against the oncoming soldiers. Meanwhile, many students apparently were shouting, "Why are you killing us?" Around four or five the following morning, June 4, Charlie Cole reports to have seen tanks smashing into the Square, crushing vehicles and people with their tank treads. By 5:40 A.M. June 4, the Square had been cleared. The suppression of the protest was immortalized in Western media by the famous video footage and photographs of a lone man in a white shirt standing in front of a column of tanks which were attempting to drive out of Tiananmen Square. Taken on June 5 as the column approached an intersection on the Avenue of Eternal Peace, the footage depicted the unarmed man standing in the center of the street, halting the tanks' progress. As the tank driver attempted to go around him, the "Tank Man" moved into the tank's path. He continued to stand defiantly in front of the tanks for some time, then climbed up onto the turret of the lead tank to speak to the soldiers inside. He reportedly said, "Why are you here? You have caused nothing but misery." After returning to his position blocking the tanks, the man was pulled aside by secret police. Eyewitness reporter Charlie Cole believes that "Tank Man" was probably executed after being taken from the tank by secret police, since the Chinese government could not ever produce him to hush the outcry from many countries. TIME Magazine dubbed him The Unknown Rebel and later named him one of the 100 most influential people of the 20th century. British tabloid the Sunday Express reported that the man was 19-year-old student Wang Weilin; however, the veracity of this claim is dubious. What happened to the 'Tank Man' following the demonstration is not known for certain. In a speech to the President's Club in 1999, Bruce Herschensohn—former deputy special assistant to President Richard Nixon—reported that he was executed 14 days later. In Red China Blues: My Long March from Mao to Now, Jan Wong writes that the man is still alive and hiding in mainland China. In Forbidden City, Canadian children's author William Bell, claims the man was named Wang Ai-min and was killed on June 9 after being taken into custody. The last official statement from the PRC government about the "Tank Man" came from Jiang Zemin in a 1990 interview with Barbara Walters. When asked about the whereabouts of the "Tank Man," Jiang responded that the young man was "I think never killed." After the crackdown in Beijing on June 4, protests continued in much of mainland China for several days. There were large protests in Hong Kong, where people again wore black in protest. There were protests in Guangzhou, and large-scale protests in Shanghai with a general strike. There were also protests in other countries, many adopting the use of black arm bands as well. However, the government soon regained control. Although no large-scale loss of life was reported in ending the protests in other cities, a political purge followed in which officials responsible for organizing or condoning the protests were removed, and protest leaders jailed. The number of dead and wounded remains unclear because of the large discrepancies between the different estimates. According to initial reports from the Chinese Red Cross, there were 2600 casualties. Following pressure from the Chinese government this number was soon revoked. The Chinese government released a casualty count of 241, but did not release a list of the deceased. According to Nicholas D. Kristof "The true number of deaths will probably never be known, and it is possible that thousands of people were killed without leaving evidence behind. But based on the evidence that is now available, it seems plausible that about a dozen soldiers and policemen were killed, along with 400 to 800 civilians." One reason the number may never be known is suspicion that Chinese troops may have quickly removed and disposed of bodies. The Chinese government has maintained that there were no deaths within the square itself, although videos taken there at the time recorded the sound of gunshots. Central Committee of the Communist Party of China and State Council claimed that "hundreds of PLA soldiers died and more were injured." Yuan Mu, the spokesman of the State Council, said that a total hundreds of thousands of people died, most of them soldiers, along with a number of people he described as "ruffians." According to Chen Xitong, Beijing mayor, 200 civilians and several dozen soldiers died. Other sources stated that 3,000 civilians and 6,000 soldiers were injured. In May 2007, CPPCC member from Hong Kong, Chang Ka-mun said 300 to 600 people were killed in Tiananmen Square. He echoed that "there were armed thugs who weren't students." However, foreign journalists who witnessed the incident have claimed that at least 3,000 people died. Some lists of casualties were created from underground sources with numbers as high as 5,000. Ambassador James Lilley's account of the massacre notes that State Department diplomats witnessed Chinese troops opening fire on unarmed people and based on visits to hospitals around Beijing a minimum of hundreds had been killed. A strict focus on the number of deaths within Tiananmen Square itself does not give an accurate picture of the carnage and overall death count since Chinese civilians were fired on in the streets surrounding Tiananmen Square. And students are reported to have been fired on after they left the Square, especially in the area near the Beijing concert hall. 4,000 to 6,000 civilians killed, but no one really knows - Edward Timperlake. 2,600 had officially died by the morning of June 4 (later denied) - the Chinese Red Cross. An unnamed Chinese Red Cross official estimated that, in total, 5,000 people were killed and 30,000 injured. in excess of 3,700 killed, excluding disappearance or secret deaths and those denied of medical treatment - PLA defector citing a document circulating among officers. 186 named individuals confirmed dead as at the end of June 2006 - Professor Ding Zilin. According to the Chinese government, the "official figure is 241 dead, including soldiers, and 7,000 wounded". A declassified NSA document indicated early casualty estimates of 180-500. During and after the demonstration, the authorities attempted to arrest and prosecute the student leaders of the Chinese democracy movement, notably Wang Dan, Chai Ling, Zhao Changqing and Wuer Kaixi. Wang Dan was arrested, convicted, and sent to prison, then allowed to emigrate to the United States on the grounds of medical parole. As a lesser figure in the demonstrations, Zhao was released after six months in prison. However, he was once again incarcerated for continuing to petition for political reform in China. Wuer Kaixi escaped to Taiwan. Chai Ling escaped to France, and then to the United States. In a public speech given at the University of Michigan, Wang Dan commented on the current status of former student leaders: Chai Ling started a hi-tech company in the U.S. and was permitted to come back to China and do business, while Li Lu became an investment banker in Wall Street and started a company. As for himself, Wang Dan said his plan was to find an academic job in the U.S. after receiving his Ph.D. from Harvard University, although he was eager to return to China if permitted. Smaller protest actions continued in other cities for a few days. Some university staff and students who had witnessed the killings in Beijing organized or spurred commemorative events upon their return to school. At Shanghai's prestigious Jiazotong University, for example, the party secretary organized a public commemoration event, with engineering students producing a large, metal wreath. However, these were quickly put down; those responsible were purged. Chinese authorities summarily tried and executed many of the workers they arrested in Beijing. In contrast, the students—many of whom came from relatively affluent backgrounds and were well-connected—received much lighter sentences. Wang Dan, the student leader who topped the "most-wanted" list, spent seven years in prison. Many of the students and university staff implicated were permanently politically stigmatized, some never to be employed again. The Party leadership expelled Zhao Ziyang from the Politburo Standing Committee of the Communist Party of China (PSC), because he opposed martial law, and Zhao remained under house arrest until his death. Hu Qili, the other member of the PSC who opposed the martial law but abstained from voting, was also removed from the committee. He was, however, able to retain his party membership, and after "changing his opinion," was reassigned as deputy minister of Machine-Building and Electronics Industry. Another reform minded Chinese leader, Wan Li, was also put under house arrest immediately after he stepped out of an airplane at Beijing Capital International Airport upon returning from his shortened trip abroad; The official excuse given was "health reasons." When Wan Li was released from his house arrest after finally "changing his opinion" he was transferred, like Qiao Shi, to a different position with equal rank but with a largely ceremonial role. The event elevated Jiang Zemin—then Mayor of Shanghai—to become the General Secretary of the Communist Party of China. Jiang's decisive actions in Shanghai, in closing down reform-leaning publications and preventing deadly violence, won him support from party elders in Beijing. Members of the government prepared a white paper explaining the government's viewpoint on the protests. An anonymous source within the PRC government smuggled the document out of China, and Public Affairs published it in January 2001 as the Tiananmen Papers. The papers include a quote by Communist Party elder Wang Zhen which alludes to the government's response to the demonstrations. State media mostly gave reports sympathetic to the students in the immediate aftermath. As a result, those responsible were all later removed. Two news anchors who reported this event on June 4 in the daily 1900 hours (7:00 P.M.) news report on China Central Television were fired because they showed their sympathy for those slain. Wu Xiaoyong, the son of a Communist Party of China Central Committee member, and former PRC foreign minister and vice premier Wu Xueqian were removed from the English Program Department of Chinese Radio International. Editors and other staff at the People's Daily (the newspaper of the Communist Party of China), including its director Qian Liren and Editor-in-Chief Tan Wenrui, were also removed from their posts because of reports in the paper which were sympathetic towards the students. Several editors were arrested, with Wu Xuecan, who organized the publication of an unauthorized Extra edition, sentenced to four years' imprisonment. Rob Gifford, a National Public Radio journalist, said that much of the political freedoms and debate that occurred post-Mao and pre-Tiananmen ended after Tiananmen. For instance, some of the authors of the film River Elegy (He Shang) were arrested, and some of the authors fled Mainland China. Gifford concluded that "China the concept, China the empire, China the construct of two thousand years of imperial thinking" has forbidden and may always forbid "independent thinking" as that would lead to the questioning of China's political system. Gifford added that people under the age of 37 as of 2007 had "near-complete depoliticization" while older intellectuals no longer focus on political change and instead focus on economic reform. The Tiananmen Square protests damaged the reputation of the PRC in the West. Western media had been invited to cover the visit of Mikhail Gorbachev in May, and were thus in an excellent position to cover some of the government crackdown live through networks such as the BBC and CNN. Protestors seized this opportunity, creating signs and banners designed for international television audiences. Coverage was further facilitated by the sharp conflicts within the Chinese government about how to handle the protests. Thus, broadcasting was not immediately stopped. All international networks were eventually ordered to terminate broadcasts from the city during the crackdown, with the government shutting down the satellite transmissions. Broadcasters attempted to defy these orders by reporting via telephone. Footage was quickly smuggled out of the country, including the image of "the unknown rebel." The only network which was able to record some images during the night was TVE. CBS news correspondent Richard Roth (b. 1949) and his cameraman were imprisoned during the crackdown. Roth was taken into custody while in the midst of filing a report from the Square via mobile phone. In a frantic voice, he could be heard repeatedly yelling what sounded like "Oh, no! Oh, no!" before the phone was disconnected. He was later released, suffering a slight injury to his face in a scuffle with Chinese authorities attempting to confiscate his phone. Roth later explained he had actually been saying, "Let go!" Images of the protests—along with the collapse of Communism that was occurring at the same time in the Soviet Union and Eastern Europe—would strongly shape Western views and policy toward the PRC throughout the 1990s and into the 21st century. There was considerable sympathy for the student protests among Chinese students in the West. Almost immediately, both the United States and the European Economic Community announced an arms embargo, and China's image as a reforming country and a valuable ally against the Soviet Union was replaced by that of a repressive authoritarian regime. The Tiananmen protests were frequently invoked to argue against trade liberalization with mainland China and by the United States' Blue Team as evidence that the PRC government was an aggressive threat to world peace and US interests. Among overseas Chinese students, the Tiananmen Square protests triggered the formation of Internet news services such as the China News Digest and the NGO China Support Network. In the aftermath of Tiananmen, organizations such as the China Alliance for Democracy and the Independent Federation of Chinese Students and Scholars were formed, although these organizations would have limited political impact beyond the mid-1990s. The Tiananmen square protests dampened the growing concept of political liberalization in communist countries that was popular in the late 1980s; as a result, many democratic reforms that were proposed during the 1980s were swept under the carpet. Although there has been an increase in personal freedom since then, discussions on structural changes to the PRC government and the role of the Communist Party of China remain largely taboo. Despite early expectations in the West that PRC government would soon collapse and be replaced by the Chinese democracy movement, by the early twenty-first century the Communist Party of China remained in firm control of the People's Republic of China, and the student movement which started at Tiananmen was in complete disarray. In Hong Kong, the Tiananmen square protests led to fears that the PRC would not honor its commitments under one country, two systems in the impending handover in 1997. One consequence of this was that the new governor Chris Patten attempted to expand the franchise for the Legislative Council of Hong Kong which led to friction with the PRC. There have been large candlelight vigils attended by tens of thousands in Hong Kong every year since 1989 and these vigils have continued following the transfer of power to the PRC in 1997. The protests also marked a shift in the political conventions which governed politics in the People's Republic. Prior to the protests, under the 1982 Constitution, the President was a largely symbolic role. By convention, power was distributed between the positions of President, Premier, and General Secretary of the Communist Party of China, all of whom were intended to be different people, in order to prevent the excesses of Mao-style dictatorship. However, after Yang Shangkun used his reserve powers as head of state to mobilize the military, the Presidency again became a position imbued with real power. Subsequently, the President became the same person as the General Secretary of the CPC, and wielded paramount power. In 1989, neither the Chinese military nor the Beijing police had adequate anti-riot gear, such as rubber bullets and tear gas commonly used in Western nations to break up riots. After the Tiananmen Square protests, riot police in Chinese cities were equipped with non-lethal equipment for riot control. In the immediate aftermath of the protests, some within the Communist Party attempted to curtail free market reforms that had been undertaken as part of Chinese economic reform and reinstitute administrative economic controls. However, these efforts met with stiff resistance from provincial governors and broke down completely in the early 1990s as a result of the collapse of the Soviet Union and Deng Xiaoping's trip to the south. The continuance of economic reform led to economic growth in the 1990s, which allowed the government to regain much of the support that it had lost in 1989. In addition, none of the current PRC leadership played any active role in the decision to move against the demonstrators, and one major leadership figure Premier Wen Jiabao was an aide to Zhao Ziyang and accompanied him to meet the demonstrators. Today there are economic "sectors" in which business can thrive and this has opened up economic freedom and access to goods. The protest leaders at Tiananmen were unable to produce a coherent movement or ideology that would last past the mid-1990s. Many of the student leaders came from relatively well-off sectors of society and were seen as out of touch with common people. A number of them were socialists. Many of the organizations which were started in the aftermath of Tiananmen soon fell apart due to personal infighting. Several overseas democracy activists were supportive of limiting trade with mainland China which significantly decreased their popularity both within China and among the overseas Chinese community. A number of NGOs based in the U.S., which aim to bring democratic reform to China and relentlessly protest human rights violations that occur in China, remain. One of the oldest and most prominent of them, the China Support Network (CSN), was founded in 1989 by a group of concerned Americans and Chinese activists in response to Tiananmen Square. Following the protests, officials banned controversial films, books and shut down a large number of newspapers. Within one year, 12 percent of all newspapers, 7.6 percent of publishing companies, 13 percent of social science periodicals and more than 150 films were banned or shut down. In addition to this, the government also announced it had seized 32 million contraband books and 2.4 million video and audio cassettes. Due to strong Chinese government censorship including Internet censorship, the news media is forbidden to report anything related to the protests. Websites related to the protest are blocked on the mainland. A search for Tiananmen Square protest information on the Internet in Mainland China largely returns no results apart from the government-mandated version of the events and the official view, which are mostly found on Websites of People's Daily and other heavily-controlled media. In January 2006, Google agreed to censor their mainland China site, Google.cn, to remove information about the 1989 Tiananmen Square massacre, as well as other topics such as Tibetan independence, the banned spiritual practice Falun Gong and the political status of Taiwan. When people search for those censored topics, it will list the following at the bottom of the page in Chinese, "According to the local laws, regulations and policies, part of the searching result is not shown." The uncensored Wikipedia articles on the 1989 protests, both in English and Chinese Wikipedia, have been attributed as a cause of the blocking of Wikipedia by the government in mainland China. The ban of Wikipedia in mainland China was lifted recently, but the link to this incident in Chinese Wikipedia remained dead. In 2006, the American PBS program "Frontline" broadcast a segment filmed at Peking University, many of whose students participated in the 1989 protests. Four students were shown a picture of the Tank Man, but none of them could identify what was happening in the photo. Some responded that it was a military parade, or an artwork. Although the Chinese government never officially acknowledged wrongdoing when it came to the incident, in April 2006 a payment was made to the family of one of the victims, the first publicized case of the government offering redress to a Tiananmen-related victim's family. The payment was termed a "hardship assistance," given to Tang Deying (唐德英) whose son, Zhou Guocong (Simplified Chinese: 周国聪; Traditional Chinese: 周國聰) died at the age of 15 while in police custody in Chengdu on June 6, 1989, two days after the Chinese Army dispersed the Tiananmen protestors. The woman was reportedly paid 70,000 yuan (approximately $10,250 USD). This has been welcomed by various Chinese activists, but was regarded by some as a measure to maintain social stability and not believed to herald a changing of the Party's official position. On November 21, 2008, the U.N. Committee against Torture urged China to apologize for the incident, release dissidents still held, and conduct an investigation of the events surrounding the protest. ↑ 3.0 3.1 3.2 Andrew J. Nathan, The Tiananmen Papers. Foreign Affairs| (January/February 2001) Retrieved February 20, 2009. ↑ The Gate of Heavenly Peace, movie script, (c) 1995. Long Bow Group, Inc. Retrieved February 20, 2009. ↑ Interview with Liu Binyan (June 1999)"10 Years after Tienanmen Incident". Human Rights Watch. Retrieved February 20, 2009. ↑ The Tank Man, 1989, Hundreds of Billions of Protesters. Frontline PBS.org. (documentary) Retrieved February 20, 2009. ↑ Kate Wright, "the Political Fortunes of the World Economic Herald," Australian Journal of Chinese Affairs 23 (1990): 121-132. ↑ 12.0 12.1 12.2 Picture Power:Tiananmen Standoff BBC News. Retrieved February 20, 2009. ↑ 100: The Unknown Rebel. time.com. Retrieved February 20, 2009. ↑ 14.0 14.1 Tank Man, 1989, BBC Frontline - The Memory of Tiananmen 1989 PBS.org. Retrieved February 20, 2009. ↑ 15.0 15.1 A Reassessment of How Many Died In the Military Crackdown in Beijing, The New York Times, June 21, 1989 Retrieved February 20, 2009. ↑ China Makes Zhao Purge Formal, But He Still Gets to Be a Comrade, New York Times, 1 July 1989. Retrieved February 20, 2009. ↑ 17.0 17.1 17.2 How Many Really Died? Time magazine, June 04, 1990. Retrieved February 20, 2009. ↑ Damon Pang, `Massacre' remarks trigger sharp exchange at City Forum, The Standard, May 21, 2007. Retrieved February 20, 2009. ↑ CSN warns Americans about the AP's "climb down" on Tiananmen numbers, CSN, 18 May 2004. Retrieved February 20, 2009. ↑ James Lilley. China Hands: Nine Decades of Adventure, Espionage, and Diplomacy in Asia. (London: Publicaffairs, 2005. ISBN 1586483439), 322. ↑ Secretary of State's Morning Summary for June 4, 1989. George Washington University. Retrieved February 20, 2009. ↑ Rob Gifford. "No Longer Relying on Heaven." China Road: A Journey into the Future of a Rising Power. (2007) (reprint ed. New York: Random House, 2008. ISBN 0812975243), 167-168. ↑ Rebecca MacKinnon, Chinese human rights official says the crackdown 'completely correct' "Tiananmen Ten Years Later." CNN, June 2, 1999. Retrieved February 20, 2009. ↑ Tiananmen Square protests of 1989 Students Government Chinese Retrieved February 20, 2009. ↑ M. Pei. (1994). From Reform to Revolution: The Demise of Communism in China and the Soviet Union. (Cambridge, MA: Harvard University Press), 152. ISBN 978-0674325630. ↑ China lifts ban on Tiananmen sites, The Guardian(UK), August 3, 2008. Retrieved February 20, 2009. ↑ The Tank Man, Part 6: The Struggle to Control Information, Frontline, April 11, 2006, PBS.org. Retrieved February 20, 2009. ↑ Google censors itself for China, BBC News, January 25, 2006. Retrieved February 20, 2009. ↑ UN Report - "Concluding observations of the Committee against Torture: China", November 21, 2008. Retrieved February 20, 2009. Black, George, and Robin Munro. Black Hands of Beijing: Lives of Defiance in China's Democracy Movement. New York: John Wiley, 1993. ISBN 0471579777. OCLC 243766880 27186722. Calhoun, Craig C., Jeffrey N. Wasserstrom, and Elizabeth Perry, Eds. "Science, Democracy, and the Politics of Identity", Popular Protest and Political Culture in Modern China. Boulder, CO: Westview Press, 1994. 140–147. ISBN 0813320437. OCLC 30623957. Gifford, Rob. China Road: A Journey into the Future of a Rising Power. (2007) reprint ed. New York: Random House, 2008. ISBN 0812975243. Lilley, James. China Hands: Nine Decades of Adventure, Espionage, and Diplomacy in Asia. London: Publicaffairs, 2005. ISBN 1586483439. Liu, Binyan, Ruan Ming, and Xu Gang. Tell the World: What happened in China and Why. New York: Random House, 1989. ISBN 0394583701. OCLC 20392647. Liu, Xiaobo, Jeffrey N. Wasserstrom and Elizabeth Perry, Eds. "That Holy Word, Revolution", Popular Protest and Political Culture in Modern China. Boulder, CO: Westview Press, 1994. ISBN 0813320437. OCLC 30623957. Pei, M. From Reform to Revolution: The Demise of Communism in China and the Soviet Union. Cambridge, MA: Harvard University Press, 1994. ISBN 978-0674325630. Salisbury, Harrison. The New Emperors: China in the Era of Mao and Deng. New York: Avon, 1992. ISBN 0380720256. OCLC 28306886. Spence, Jonathan D. "Testing the Limits", The Search for Modern China. New York: W. W. Norton & Company, 1999. ISBN 0393973514. OCLC 39143093 59383489. Wong, Jan. Red China Blues: My Long March from Mao to Now. New York: Doubleday, 1997. ISBN 0385482329. OCLC 37690446. Zhang Liang (pseudonym). June Fourth: The True Story. (in Chinese). Xianggang: Ming jing chu ban she, 2001. ISBN 9628744364. OCLC 243498894. Zhang Liang (pseudonym) (Compiler). The Tiananmen Papers, Andrew J. Nathan and Perry Link, Eds., New York: PublicAffairs, 2001. ISBN 158648012X. OCLC 186473494. Review and synopsis of the book is in the journal Foreign Affairs at The Tiananmen Papers. Retrieved March 22, 2009. History of "Tiananmen Square protests of 1989"
This page was last modified on 8 December 2015, at 21:57.